Do you recall ever seeing Ben Cartwright, Hoss, or Little Joe get into a middle-of-the-street gunfight with anybody on the famous Bonanza TV program? Maybe Lil’ Joe or Adam, but never Pa Cartwright. Saw it happen a lot on Gunsmoke. Even the opening scene for many years showed one. Matt Dillon blasting away at someone. But then it was really just the same gunfight shown over and over at the opening credits each week. Then there was Jack Palance as gunfighter Jack Wilson in 1953’s Shane with Alan Ladd. When you come to Pioche, Nevada on U.S. 93 for a visit this summer, you won’t see those staged gunfights for tourists that some other Old West towns are known to exhibit. But there was a time in the days of the Old West when the mountain mining town of Pioche was a place full of gunslingers, back in its hectic, near lawless history of the early 1870s. It was reported nearly 60 percent of Nevada’s killings in 1871-72 occurred in Pioche. Mine owners employed hired guns to protect their mining claims from claim jumpers. Or, in other cases, gunslingers were brought in, and they would do the claim jumping. That in itself is another good story. As has been well noted, in old Pioche of those days, the only law was the six-gun, and it spoke often. Some of the local guns were pretty fast draws. But just by way of a side note though, the gunslingers of the Old West, would be no match whatsoever to the fast draw experts of modern times, but that’s not the focus of our story. In his book, Law and Disorder in Pioche, historian/author Leo Schafer tells of one hot shot fast gun who came to Pioche looking for action, and never left. Fast as any gunfighter thought he might be, lurking somewhere in the future would be someone who was always faster. A man had to remember that as the years passed and he got older. Like many western towns of that time, Pioche also had a Boot Hill, full of those who died in shootouts, or just plain murders, with their boots on, and were often buried that way in the cemetery. Boot Hill is still there, and you can still see some of the wooden grave markers, weather worn and faded quite a bit now with the passage of time. They are all in a long line, one after the other. As Schafer writes, most mining towns, most certainly Pioche, had a local top gun. Gunmen prided themselves on speed and a good aim. Had to be that way, the alternative could be most unpleasant. Notches on his gun indicated his reputation, and some had quite a few. 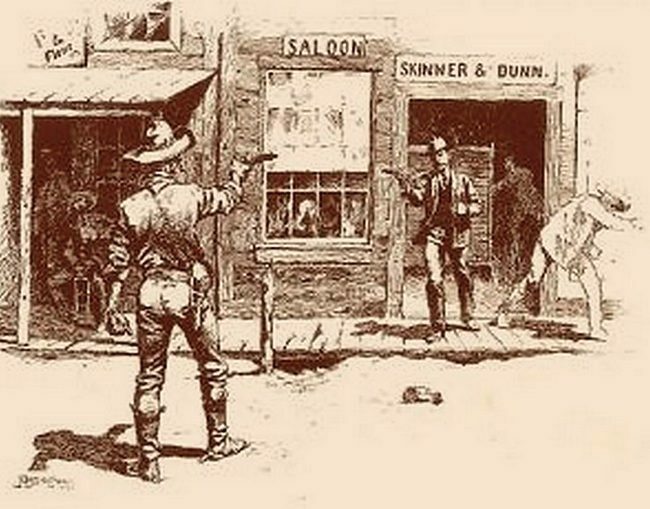 Any of the gunmen who came to Pioche were likely known gunfighters, with a reputation that may have travelled far, even if he himself was willing to stay more closely around Pioche. “One day,” Schafer notes, “a stranger got off the stage and wandered around the town, visiting the booze parlors to see what he could see.” Pioche had several dozen at certain times, so it might have taken a couple of hours or more for a look around. Maybe he indulged in a drink or two, most likely he did. News of such a challenge spread through the main street of town as fast as wildfire. The local top gun heard about it too. Maybe it was a bluff on the part of the brash young man, but it was not going to make anybody run either. It was challenge to the local man, an offer he couldn’t refuse. Pioche was not only a mining town, it was a gambling town, too. But things were happening so fast, there may not have been enough time for anyone to take bets on what the outcome might be. Besides, who was this upstart stranger anyhow? The local gunman went out onto the hard pack dirt street and starting walking. The stranger did likewise, slowly walking toward his opponent. The air was thick with tension. There’s was going to be a big noise on the streets on Pioche, again, and in just a short time, nobody knew just when, but anticipation was high. Like a scene from a western movie – especially some of the better ones – or a TV show, when the two were about fifty feet apart, one made a move, so did the other. Boom! Boom! The stranger went down. He was carried into a nearby saloon and all he said was, “Pull my boots off quick.” It was considered a disgrace to die with your boots on. Schafer doesn’t say if his request was followed, nor does he say who the local gunman was, and that doesn’t really matter.